"Hi my name is Jesse V..... and my for four high school classmates and I are entering the National History Day competition. We really want to make a hand crank cotton gin as a physical model for our project. We wanted to show how Eli Whitney's cotton gin impacted slavery in the United States. I've been looking all over the web for models or blueprints for making one but they either are way overpriced or unavailable. I was wondering if you had blueprints for making a hand crank cotton gin or something like it. If you do then your help will be greatly appreciated. I hope to hear from you soon." "Hi Jesse, To make a cotton gin like the one that Eli Whitney designed takes a little more work than a roller gin. The roller gin was used for ginning long staple cotton like Sea Island or Pima. The seed on the long staple cotton was like a watermelon seed, there are no linters (fibers) attached to the seed and so you can use a pasta machine or an old wringer washing machine...all you need is two rollers and feed the cotton in and the cotton squeezes through the rollers and the seed drops in front. 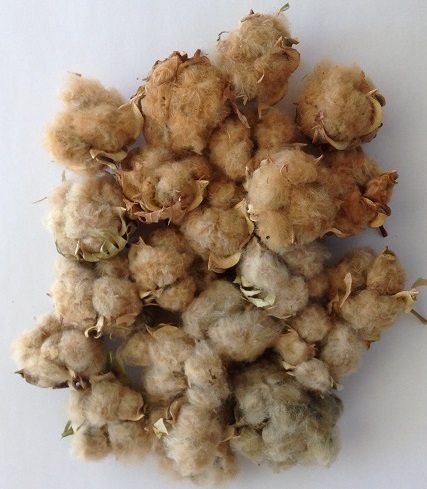 For Upland or short staple cotton like that which grew in the southeast, the seed has linters that stick to the seed. So then a metal plate with very narrow slots in it must be constructed and then saw blades pass through the slots and tear the cotton from the seeds, bringing the cotton through the slots and dropping the seeds behind the metal plate. To purchase such a gin is very costly. Hopefully that will give you some idea how both gins work. Good luck to you and your classmates. Sincerely, Joan"
We hope Jesse and his classmates ROCK the competition at the National History Day competition! 2016 COTTON HARVEST PHOTO CONTEST WINNER! "I don't find it difficult growing cotton here. Just have to remember to start the seeds off early enough - usually in the greenhouse when the temperature gets to 20 deg C. Normally I plant them out into the garden when they're a bit bigger and get a pretty good crop that way, but this year I decided to leave them in the greenhouse in large pots, mainly so I could extend the season. 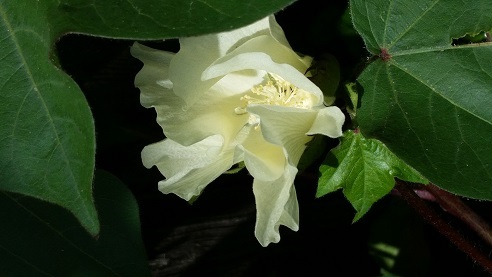 Most of the bolls have opened this way, whereas I don't get quite as much cotton from the garden. The greenhouse is an old dilapidated swimming pool that we inherited with the house. We spent the first 6 or 7 years here trying to work out what to do with it, then I remembered something I'd heard years ago on a UK gardening programme on the radio. It was "listener's question time" and someone said they had an old pool in their garden and what could they do with it. One of the panel of gardeners said "Put a roof on it and make it into a greenhouse". Voila - that's exactly what we did. The pool was 15m x 7m, so pretty big. We put a clear roof over half of it, built a wall in the middle as a separator, then put a solid roof on the rest of it for storage with a connecting door between the two. There's plenty of height inside, so the plants can grow away happily in their pots. We get fairly hot summers here, and it does get rather hot in the greenhouse. I just leave the door open, give them plenty of water, feed them maybe once a week, and they do well. 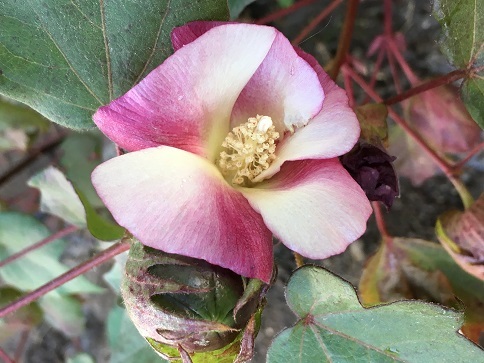 The only problems I've had were aphids early on in the summer - dealt with those with a washing up liquid solution sprayed on every day or so, and, once the bolls started opening, a mouse nested in the stored plant pots and stole the cotton from some of the bolls for its nest! Cheeky! It took me a while to find out what was happening there - I blamed birds at first. 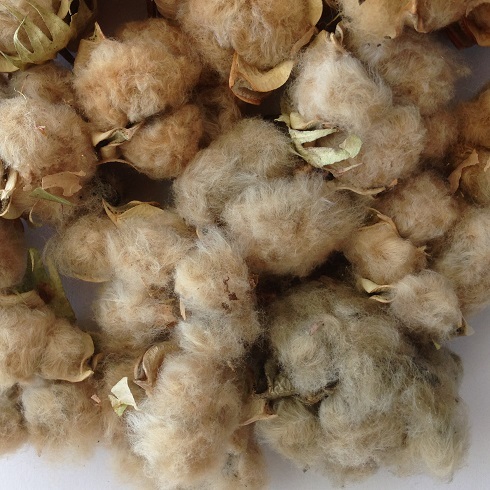 Little story about how I started to grow cotton in earnest. I'd bought a sprig of cotton to put in a vase on my window ledge. It sat there for about 2 years, and it suddenly occurred to me that there must be seeds in there. I planted 4 seeds and, lo and behold, they all grew. 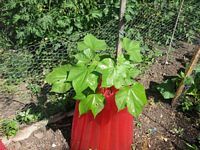 Whilst they were still at the seedling stage a friend from the UK came to visit, saw the pot with the cotton in it and asked what it was. When I told him "cotton" he laughed uproariously and said "You'll never grow that here". This from a plant scientist expert! 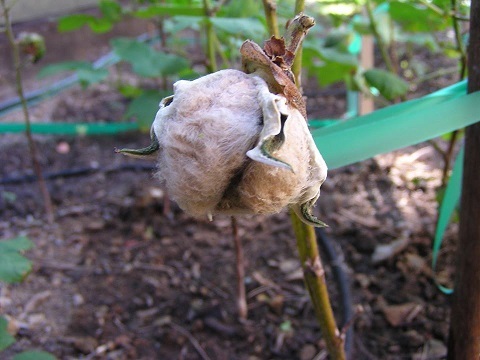 He was actually right that first year - although I had a few flowers, the cotton bolls didn't develop because I'd planted them too late. However, I was determined to prove him wrong, so a year or so later I had another go. 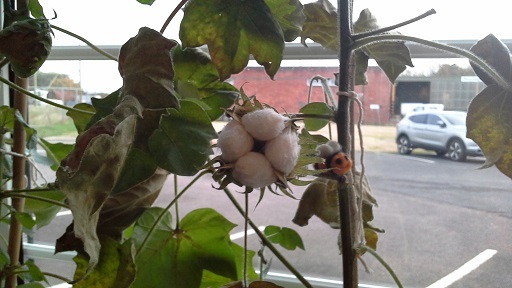 The very first cotton boll to open was put into a package and posted off to him as a reminder to "never say never"! He was rather surprised, but also very pleased that he'd been the one to challenge me. . . . and I've been growing it ever since! Sorry to rabbit on for so long, but I really do love my cotton!" Thank you, Christine - we love your cotton, too! Here are all the pictures received for the COTTTON HARVEST 2016 CONTEST - Enjoy! 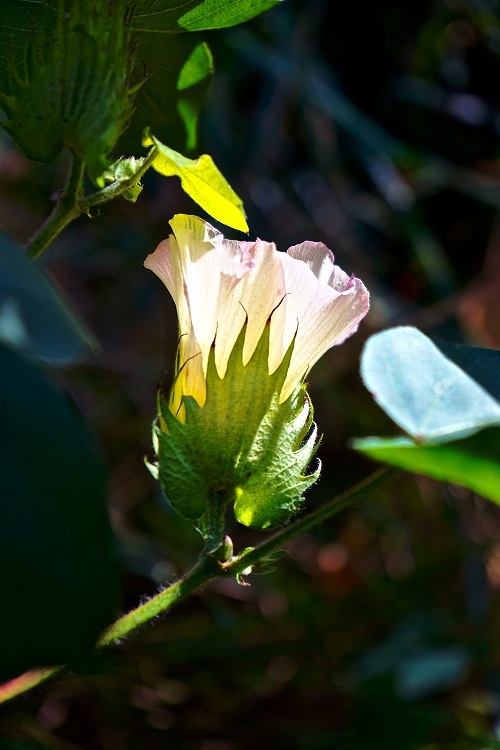 White Cotton Plant by Cary S.
Like others, "GoldySpinner" Chris S. had trouble choosing the picture to send. "Stranger in the Crowd" was grown in SW France in 2016. 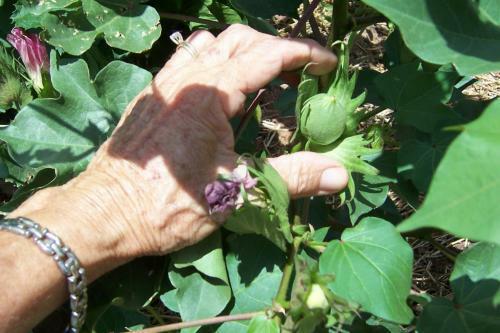 Norma C. grew 3 types of cotton on her Peaceful by Nature Farm near Athens, Ohio this year. 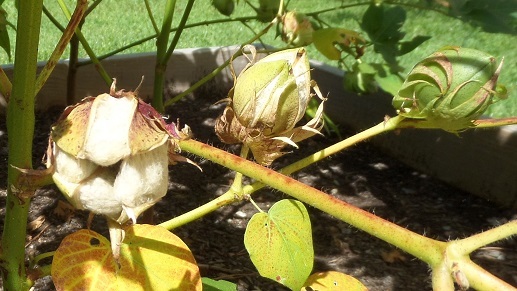 This photo is of her Red Foliated White Cotton. She purchased the seed from Southern Exposure Seed Exchange and also grew Erleen's Green and Nankeen (brown). All seed was organic. Leigh Ann wrote that "This is Sea Green Sally's Breeding that I got from my visit to her fields last November. I had a hard time picking just one picture....I am growing 3 colors of cotton this year and they are all just beautiful." THANK YOU ALL FOR YOUR HARD WORK AND BEAUTIFUL PHOTOS! Thank you to everyone who sent pictures of their 2015 cotton harvest! Our judge for our first-ever picture contest is retired cotton farmer and artist, Dale Hedges from Elfrida, Arizona. Thank you, Dale for your time and interest! Joan wants to extend a big thank-you to all who took the time to send in pictures! All were outstanding and Mr. Hedges really enjoyed seeing them and having the honor of judging. Watch the web site next fall for the 2016 Cotton Photo contest. As we expect a lot more photos next year, we want you to select just one special photo and you have all summer to get that GREAT photo! The Cotton Harvest Photo Contest for 2015 is finished, but here are the entries we received - thank you all so much for sending photos! 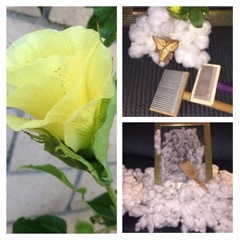 Here is an excellent collage from Leigh Ann showing flowering through boll opening from her huge cotton plant - wow! 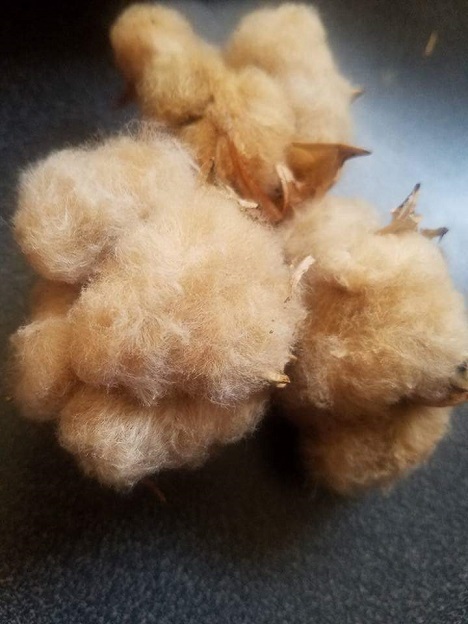 Sandra sent pictures of her "many shades of brown" cotton and wrote "These are bolls from a plant I grew from seed that was gifted to me. It began as a seedling in a pot, wintered over in the house and then planted in very early spring in our California desert. It grew to be almost 6' tall. I've never grown cotton before and did not know what to expect. 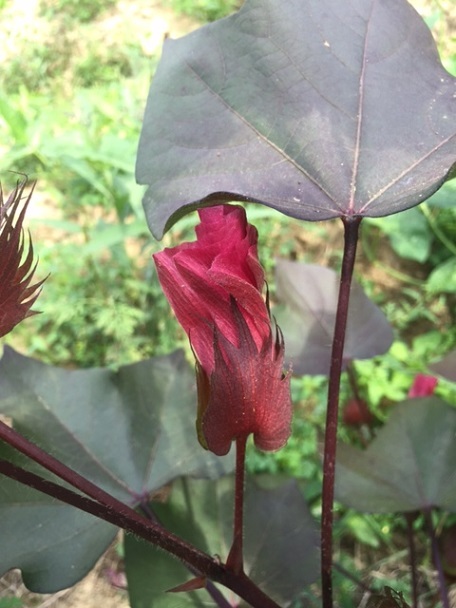 It continues to produce and has shown to be slightly different colors on the one plant. A medium grey, a lovely medium brown and a light fawn." It is wonderful to see how many first-time home growers there are this year! Thank you, Sandra! 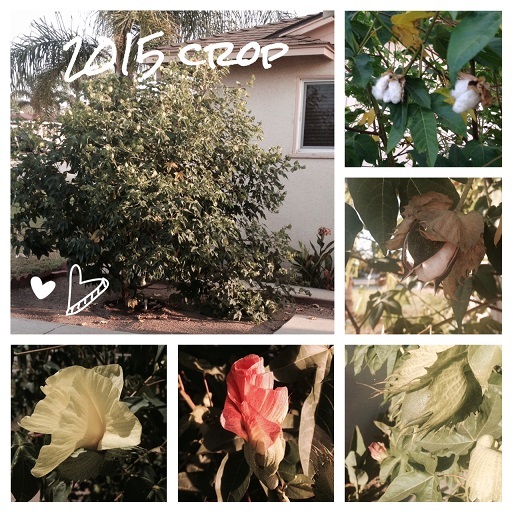 Jan from Southern California has a bumper crop this year! She wrote "I have a Pima cotton tree that produced 15 pounds of pre-ginned cotton. 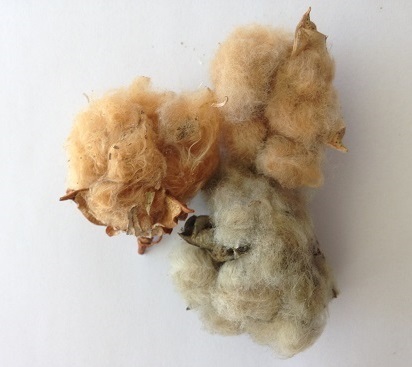 My photo shows the cotton flower, my DIY Cotton Gin in which I show the staple length of my cotton on the upper left hand side, and my ‘crop’ for 2015. Thank you so much for being such an inspiration to all of us. I am new to prepping and spinning cotton and find it so exciting! 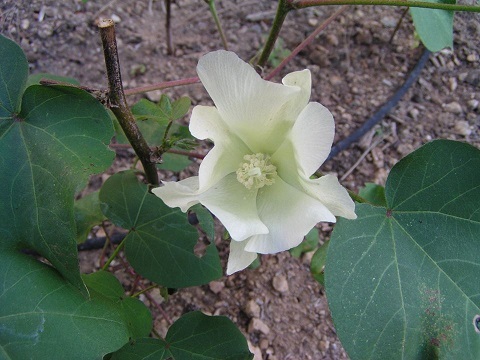 With a home cotton crop like that to work with this winter, anyone would be excited! So inspiring to see the wonderful work being done all over the country. Thanks, Jan! Gary shows us start to finish what it means to grow and harvest cotton. He wrote "My cotton crop - first time. My first pick! 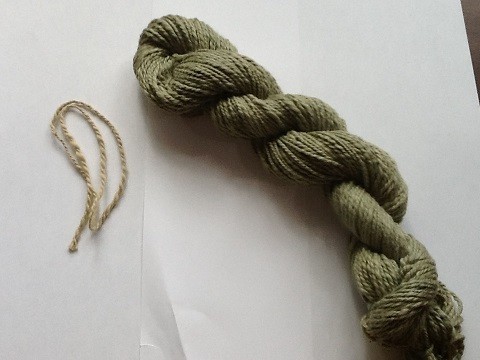 A skein of spun cotton!" Thank you for the inspiration, Gary! 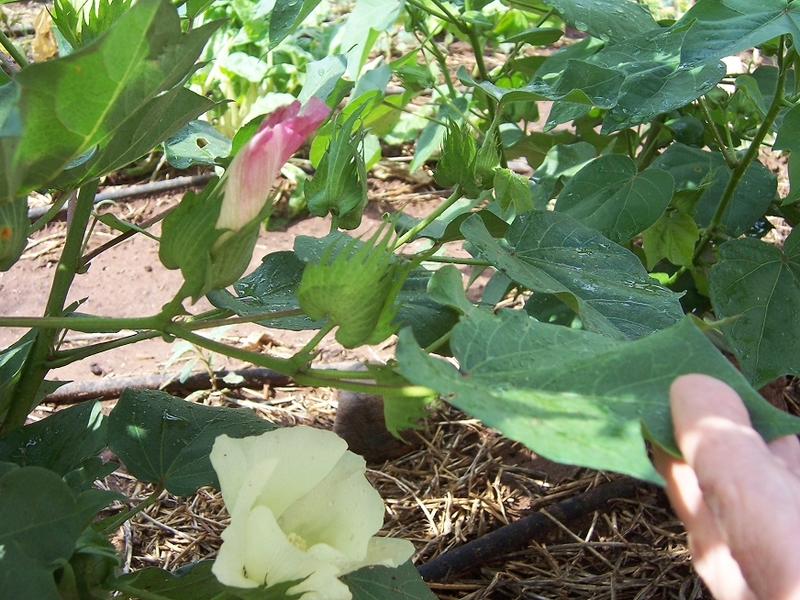 Karen B. wrote "This was my first year to grow cotton. My husband did all the work - below are some pictures. One is our first boll which is brown. These came from bolls you sent me a few years ago." 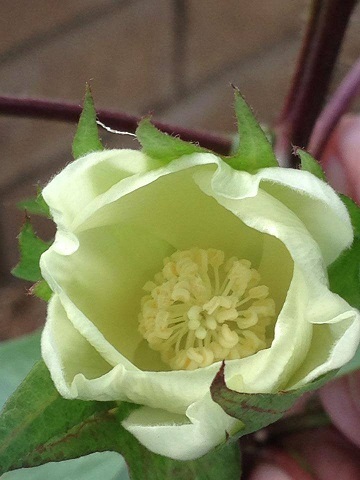 Judith wrote: "I live in Norfolk, England at the moment and I have attached a photo of a cotton plant that I have been growing indoors. I am moving back to Ireland next month and fully intend to try to grow more cotton there." Thanks for the inspiring photo, Judith! "I'm in Maryland outside of Baltimore. I grew 13 plants in my garden out back this past year, mostly green and brown varieties. Tons of bolls are still on the vines, but I'm not sure they'll fully ripen. I harvested only a few bolls thus far. I think I got them to a too-late start. But I will say that no matter what the final harvest, I greatly enjoyed all the beautiful flowers the plants provided all the way through early November. 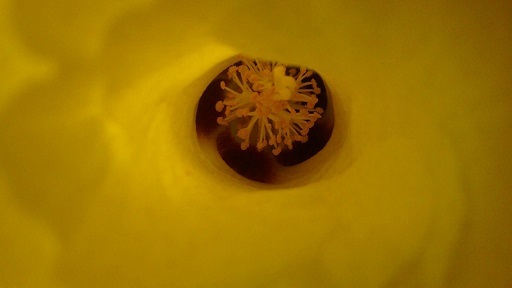 Here's a detailed photo I took of one flower:"
This first one is from Heather: "This is my favorite because it shows 3 stages at once :) I can't wait to see all the pictures, what fun!" Great picture, Heather - thanks so much for sharing! Thanks to all who submitted photos for the 2015 contest! 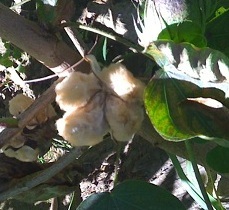 Joan has grown cotton in her home garden since 2005. 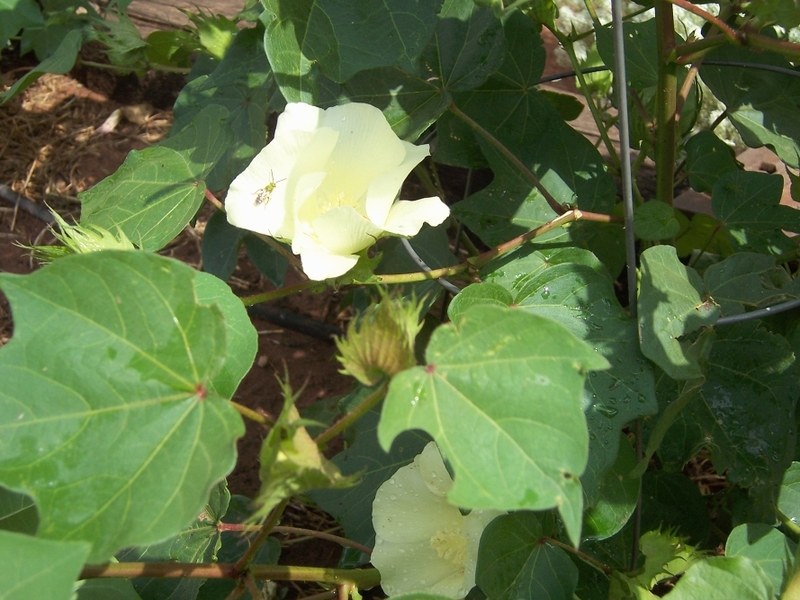 Watch for more information on how you can grown cotton at home, too. 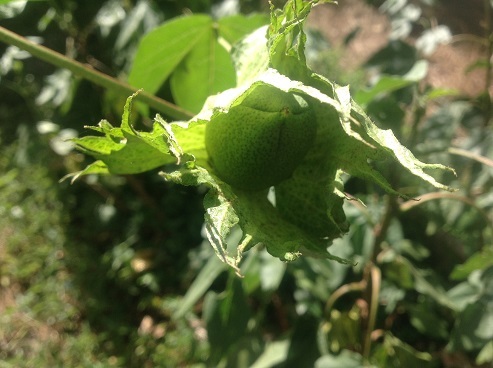 Here you can get an idea of the size of the boll as it is maturing. 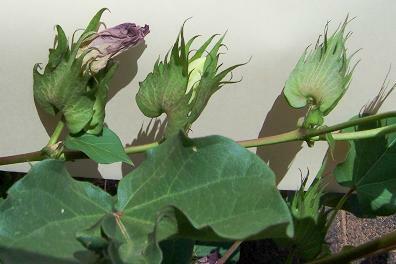 Two stages of the cotton flower. She writes that "I didn't think I'd ever get cotton. They've been bolls for so long. The plants are still flowering at the top. Only a few more weeks until frost, so right before that I'll try the dehydrator for the unopened ones." 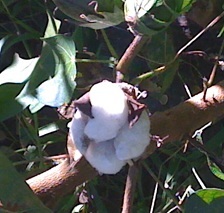 Judy got both white and colored cotton from her seeds. I have five plants growing strong in the hot Wisconsin summer. Only one variety germinated but the five seedlings that made it are about 2.5 or 3 feet tall. (photo attached). I dont know which variety they are because my labels werent waterproof, but I think they are either the brown or the green. This is my learning year! As you can see, I have water walls around them for added heat. The photo was taken a week or two ago, and the hot spell has boosted the growth since then. Lots of fun! Joan writes "Cary Ann, my granddaughter who is working for USDA and helping farmers in this area took the picture. In a field of 500 acres of cotton, this one leaf stood out as different. Half of the leaf is the normal green and the other half has been deprived of nitrogen and turned yellow." 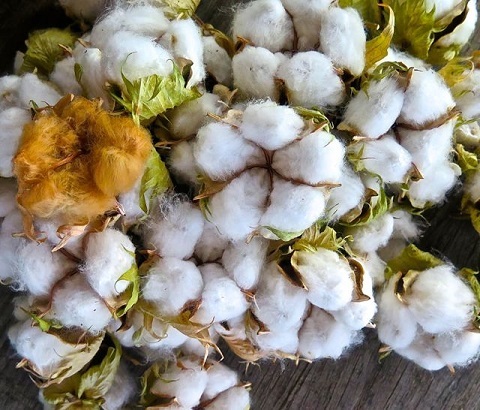 Do you have cotton that you grew from seed? 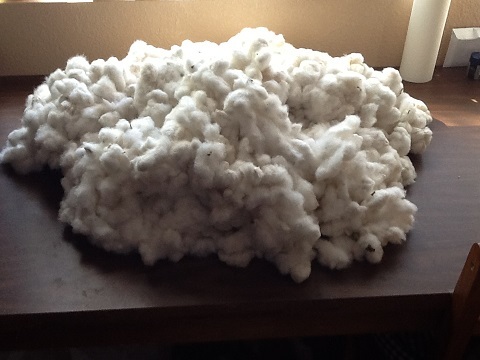 Send your pictures and updates to SpinCotton(at)Yahoo(dot)com!